To give an idea of the importance of sidewalk and road care before people and cars required better solutions, Albert (called Ab) Hughes recalled in an interview (a separate internet record in this collection) that most village streets in the late 1800's were dusty, rutted and often muddy. Sidewalks in the Village of Oakville were plank. A water cart may have been paid to sprinkle the dirt roads when the dust was particularly bad. A major road may have had crushed stone laid. The work was paid for by area residents and done by area residents. One of the earliest recorded sidewalk commissioner reports was reported in the Spring 2012 TTHS newsletter. In 1852 the Trafalgar Township Council decided that "under By-Law 48 Palermo to commute half of their statute labour and apply amount for construction of sidewalks. Residents petitioned May 1852 and an extra levy was charged. Commissioners: H.M. Switzer, Joseph Simons, John Soules." For 1883-1884, the Palermo Sidwalk Commission Report was given to Trafalgar Township by Commissioners M. McCrimmon and W.H. Hager. The 1910 4 page report shown here in 2 images (pages 1 and 4 shown in the main page image, pages 2 and 3 can be seen in the 2nd image.) It shows the names and amounts subscribed by local Palermo residents for "Teaming and Labor". The amount of "Cash Subscribed" is individually listed for each donor. Page 4 shows the financial record of "Cash Receipts" and "Expenditures". 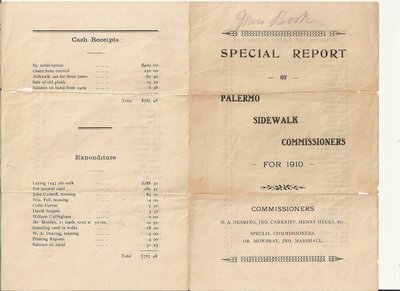 The Palermo Sidewalk Commissioners in 1910 were W.A. Dearing, Jno. Carkriff, Henry Heeks was Secretary. Special Commissioners were Dr. Mowbray and Jno Marshall. The subscribers show the community families at the time. The following local people were able to provide practical materials and skills: John Carkriff, William Pell and W.A. Dearing brought their teams and worked. Mr. Morden supplied 21 loads of sand. Mr. Paul Campbell supplied 55 loads of gravel. The thrifty Committee were able to sell the old planks. This Report was Miss Book's copy. She had given a cash donation for the 1910 work. In the 1901 Canada Census, she is listed as "Ettie Book", age 52, single, head of Household, born in Ontario, Methodist. Handwritten on the cover in pencil: Miss Book. Handwritten in ink on page 3 entitled "Cash Subscribed" after the donor identified as "A Friend" is the name, "Dr. Book". Ettie L. Book, 1848-1925. Dr. James Burgess Book, 1843-1916. The parents of this brother and sister were: Jonathan Johnson Book, 1815–1861 and Hannah Priscilla (Smith) Book 1814–1897.